SEOUL, Oct. 18 (Yonhap) — A global consortium led by Hyundai Engineering Co. has completed the construction of a US$3 billion petrochemical plant in Turkmenistan as the Turkmen president praised the South Korean firm, the company said Thursday. 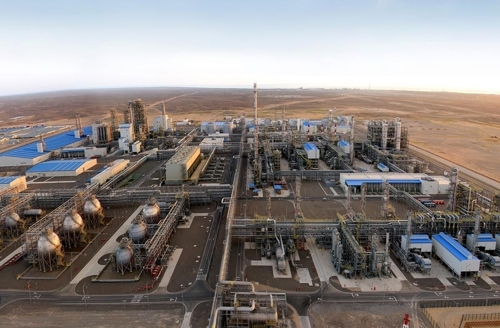 It took 47 months for the consortium to build the petrochemical plant at Kiyanly on the west coast of Turkmenistan, Hyundai Engineering said in a statement. President Gurbanguly Berdymukhamedov praised Hyundai Engineering for successfully completing the project — the first petrochemical plant in the central Asian country — in an opening ceremony that drew some 500 participants. South Korean President Moon Jae-in’s special envoy, Chung Sye-kyun, expressed hope that the two countries will further expand economic cooperation and hold exchanges in various fields. The plant is expected to extract 6 million tons of natural gas in the region and produce 400,000 tons of polyethylene and 80,000 tons of polypropylene annually, using an ethane cracker that helps produce the two petrochemical products through thermal decomposition, the company said. Hyundai Engineering said the petrochemical output will generate a profit of $600 million for the Turkmen government each year. Turkmenistan has the world’s fourth-largest natural gas reserves. Hyundai Engineering controls a 64.46 percent stake in the consortium, with Toyo Engineering Corp. of Japan holding a 28.78 percent stake and LG International Corp. owning a 6.75 percent stake, a company spokesman said.